All it takes is an innocent line of questioning, and I come to realize there are voids in general knowledge on whatever the line of questioning was on – nailing, sanding, or customer relations. While helping a good friend and fellow contractor, Sprigg Lynn of Universal Floors at the U.S. Supreme Court, I had six days of interaction with his team. I would hire these the guys in an instant. Not only for just their flooring abilities, but because they were genuinely nice guys. Nothing was beneath them to do, never a bad attitude, a complaint, a refusal about anything assigned to them on the job. But that is for another blog. This one is on sandpaper mineral to be specific. The line of questioning started on what sandpaper/sequence I use. Not a one-line answer for sure, but I lead to this blog’s theme, and that is sanding factory finished floors with Aluminum Oxide (AlO). Why IS it that sandpaper regardless of mineral type, almost with no regard to grit, has such a difficult time in getting through the finish coating and dulls the paper out so fast? Experience shows that most factory-finished floors laugh at you when you attempt to remove it from the floor. Taking a point of view from the floor, here come lots of spinning boulders relative to the micro-grained specs suspended in the coating. As the sandpaper contacts the AlO, those micro-grained specs of AlO are hard enough to sand away the very tips of the mineral on the moving paper. What’s happening is the floor finish is sanding away your sandpaper! From a hardness scale, AlO is up there, very close to diamond. Sandpaper minerals are no more than equal to AlO if not sometimes softer, due to proprietary blends of other natural and/or synthetic minerals. They are designed to sand bare wood with mineral selections for various performance features: longer lasting sharpness (less friable) to softer cutting (more friable) for less noticeable scratches and other features. AlO doesn’t care about all that, its just as hard and there are millions if not billions of micro-grains of AlO attacking the very points of your sandpaper, with no chance of the sandpaper getting to bare wood where it can do its work. If you actually get through, you notice you are burnishing and not sanding the bare wood with the dulled-out mineral you have spinning around under your machine. According to the NWFA Sand & Finish Guidelines, if the floor was factory-finished, determine what type of finish was applied. High-abrasion finishes such as aluminum oxide may be difficult to sand. High-abrasion finishes may respond better by using a fine-grit (80-grit or finer grit ceramic-fired) abrasive as the first grit used, followed by a coarser grit to begin the upward grit progression to remove these surface finishes. The best you can do is go to a diamond-encrusted product that will overcome the AlO’s hardness, get past it to near or at the bare wood and then switch to your mineral of choice. 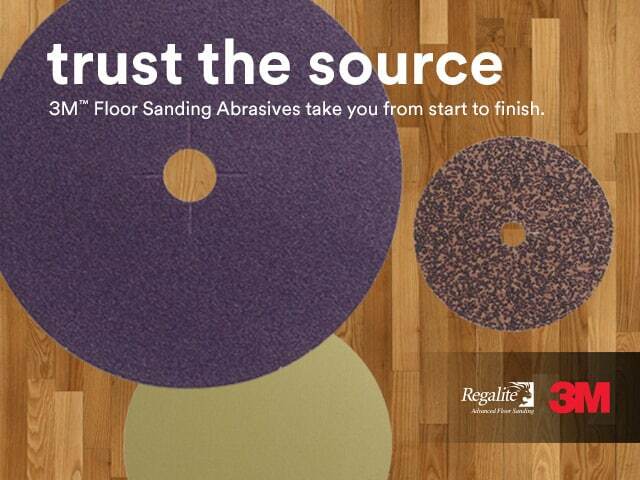 Keep this in mind when you are tasked to sand a factory finished floor and bid your work accordingly. NWFA. (2016). Sanding Previously Finished Floors. Wood Flooring Sand and Finish Guidelines, p. 19. I got tired of buying different mineral papers. Different brands, trying all kinds of sanding sequences, in the end I never felt like I was getting full potential from my paper. Felt like I was wasting time and money. So now I own two diamabrushes, we run them almost exclusively on AO floors and love how easy it takes it off, it takes time but works very well. After running the diamabrush we then start sanding the floor in our normal sanding sequence, so you save money on paper, but it’s going to cost you some extra labor. So definitely you have to charge more than your normal refinishing price to cover the extra labor. I got tired of buying different mineral papers, different brands, trying all kinds of sanding sequences, in the end I never felt I was getting full potential from my paper. Felt like I was wasting time and money. So now I own two diamabrushes, we run them almost exclusively on AO floors and love how easy it takes it off, it takes time but works very well. After running the diamabrush we then start sanding the floor in our normal sanding sequence, so you save money on paper, but it’s going to cost you some extra labor. So definitely you have to charge more than your normal refinishing price to cover the extra labor. I hit it with 16. Works everytime. James and the Giant Floor Sander.